Kidrobot Black- ‘Behind the Vinyl’ with Alex Pardee. I like to believe that monsters are real. I always have. Actually, I KNOW monsters are real, they’re just really good at hiding. As part of the Kidrobot X anniversary celebration, Kidrobot New York will be serving up the super limited Silver King 8-inch Dunny by Tristan Eaton. Bigfoot’s Kidrobot Exclusive Forest Warlord Is Coming For You! Bigfoot’s formidable Forest Warlord is coming soon to Kidrobot in a new killer exclusive color way. Find out what is on the menu this year in The Cultyard. Last Friday, Joe Ledbetter and The Loyal Subjects served up an exclusive Veggie Burger Bunny for our pre-release signing at Kidrobot Los Angeles. 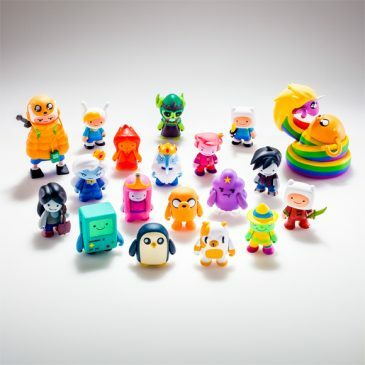 Introducing the Kidrobot City ‘Bots Mini’s. Each 3-inch vinyl figure highlights the city where it is exclusively sold by showcasing the characteristics that the city and its citizens are famous for. Order up! Kidrobot Los Angeles and The Loyal Subject are serving up an exclusive Veggie version of Joe Ledbetter’s wooden Burger Bunny with a special side “Nice Buns” prints. SF artist and toy designer Huck Gee rolled through KRHQ to chat with Wheelbarrow about art, graffiti, toys and his early days at Kidrobot.